yes, i can’t take my eyes off that amazing shadow either, perhaps one of the best ever captured on a baseball card. it looks like it might even have been doctored, so much straighter than cito’s sorry excuse for a batting stance. it also looks almost impossibly small, perhaps foretelling gaston’s eventual move to pittsburgh for two final games that year, the last of his career, in which he went 1-for-2 for a batting average of .500. Alan Watts said the past seems fixed and permanent and the future stretches out to infinity and the present seems to be only a thin, illusory dividing line between the two, but that in fact, the opposite is true, it is only the present that is infinite and real. I have very mixed feelings about Alan Watts, but I thought that was a good line. But it’s not quite as pure. There seems to be another form (the photographer) encroaching on Rockett’s. That is a good line from Watts. Whatever else you can say about him, he certainly had a way with words. I used to love to sit around in the afternoon watching a beam of sun move across the floor as I listened to one or another of Watts’ hypnotic lectures being replayed on WFMU (way back in the early 1990s). Pat Rockett’s shadow appears to be wearing a top hat, or maybe a bowler. Either way, he probably has a goatee. That’s how you know it’s the evil Pat Rockett. Josh, your prose is so wonderful. That it is in the context of the examination of a baseball card that you say “The past is gone and the future isn’t here, and the present is something we often barely show up for. While traveling from forgettable moment to forgettable moment, we have an air of distraction…” is all the more stunning. Plus, I cannot get over how you look at these cards and find things in them that, in my youth when I first held such cards, I could never have even given any thought to. He’s wearing a warm-up jacket, so he didn’t take the time to work the photographer. He isn’t in a proper batting stance, the stadium is empty, etc. I think I knew that some cards were a little bit odd, but from my earliest memories, they just were that way. It took me a while to find an image of it, but when I did, I was thinking “yes, that pose, so unnatural, yet so very much what I remember from that era.” Heck, when they took pictures of us for T-Ball, they certainly used as awkward or forced poses. It just seemed natural. But it isn’t. 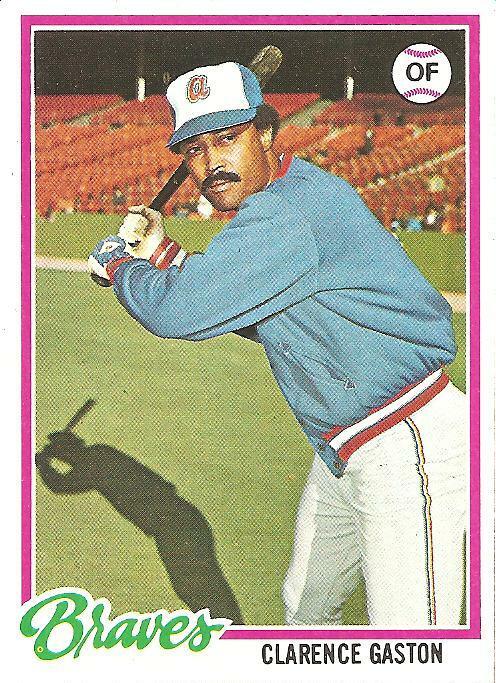 That ’76 Garvey card is a classic. It’s one of the cards that gets a pretty sizable spotlight in my book. Are you sure that isn’t Nate Colbert? with Nate Colbert. That’s what baseball cards will do to you. thought Al Bumbry was Rich Coggins. It seems pretty obvious that all the ’78 Braves Candlestick shots (which is everyone we’ve seen so far except Matthews, Asselstine, Messersmith, Capra (Capra is Riverfront, I think) and maybe Burroughs) are from the same day. Assuming they’re from 1977 (there’s something about Willie Mac and a number on the scoreboard behind Phil Neikro–McCovey had been away from SF for a few years until ’77, and was closing in on 2000 hits and 500 HR in ’77, so that has to be the year), the Braves went to SF 3 times: May, July, and September. The May and July series were weekends. And you don’t get long shadows like that a little before noon in July. So I’m saying it was either Saturday May 28th or Sunday May 29th, 1977 that most of the ’78 Topps Braves were photographed. The highs were in the 60s both days but pre-noon in SF with the winds, I can see the need for the cold weather gear they all have on. And the Modesto Bee said it would be fair both days, except for some early and late clouds. And the crowds were sparse both days. If I had to guess whether it was Saturday or Sunday, I’d say Sunday, based on not much other than that seems to be the more common day for the Topps photogs of the day. That day’s game was scheduled for 12:45–or at least the radio broadcast was. So based on that, on the day of these pics, your hitting star was Willie Montanez, who went 4 for 5 with a double, just two days after coming off the DL. “”When you can hit, you can hit,” shrugged Montanez,” said that day’s AP article. But it wasn’t enough as the Braves lost in 10, the winning run scoring when Jerry Royster bobbled Tim Foli’s sharp grounder. It always impresses me when someone does the research such as that, pinpointing the date of an event from the few clues in a picture. I’ve been to Candlestick a number of times, but didn’t even notice that these shots were taken there. What is the Play Ball result on this card? If it’s a triple or a home run that would be so depressing for team Love. I’ve been away awhile. My apologies. I read something about Mark Lemongello yesterday, and it brought everything back to the glorious 70s. All in life seems to eventually bring us home again. It’s good to read the Gods again. I saw some great reviews of your book Josh, and finally I’m determined to go out and get it. I have to bring up the shadow in that Cito card. Josh, you are the best at drawing upon meaning from the most subtle of details, but you say nothing of that shadow. Here is my request: Please Wilkerize the meaning of that shadow . . . there are so many directions to go with this, and only you can do it justice! Hey, Catfish. I agree that the shadow is the best part of the card. The last lines of the post are a reference to the shadow.